My sons were going through a box of childhood memorabilia this afternoon and discovered this priceless artifact which Jonah immediately photographed and put on Facebook because none of his friends would ever believe him when he told them about this incredible spasm of parental whatever. Former (and current) students of mine — to whom I am affectionately known as the Shredder — will recognize an age appropriate variant of my reading rubric. I should add that neither of my children suffered lasting damage from this experience, aside from the facial tics, insomnia, chronic nightmares, bleeding ulcers, claustrophobia, agoraphobia, and an irrational fear that the books they are reading are not long enough. Outstanding. What a good father you are, and what lucky kids they were, despite the bleeding ulcers. Did they take you up on your challenge? Do they have good memories of these exercises? Tell us more. They became fabulously wealthy and I was impoverished. Who could have predicted Animorphs? Tavia, Thank you for seeing the good intention behind the insanity. 🙂 It never hurts to set goals, I suppose. As for memories, I think they are mostly in the nature of war stories. They like to regale their friends with stories of my eccentricities. But they both turned out to be rather good writers. You’re such an amazing father. Merry Christmas. I’d like to see these salary scales applied (post-haste) to the NC editorial team. I’ve re-contacted my attorney and we will be needing a copy of this document for evidentiary purposes and collection of back pay. I knew something was up…all the money has been going to the Glover boys. Rich, Why does the equation masthead=blood-sucking vampires suddenly make sense to me? 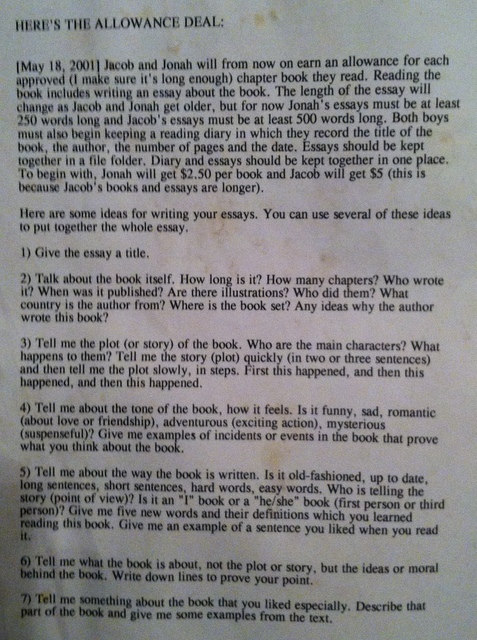 Many of my high school students wouldn’t be able to follow the directions on your rubric, so I’d say you were wise to inflict true literacy on your kids at an early age. If I started paying my students, do you think they’d get smarter? An interesting question. I thought a lot about the ethics of paying for reading. But then I thought that in this world money is the universal sign of value and if you don’t tell a kid something is valuable in a way he can understand, then he won’t get the message. The school system is the last vestige of slavery, a place where you do an immense amount of work for no pay (little gold stars beside your name!). I sometimes think a thoroughly modern school system would find a way to pay kids for the work they do (instead of promising them that somehow this will eventuate into a job). The art is in finding the appropriate amount: enough to indicate value and recognition, but not enough to inflate fantasies of grandiosity. thank you, v. I always like to make you laugh. We are totally stealing this! Luckily, Vivian’s grandsons may still think $5 is an appropriate fee, and they have been exposed to a number of the neuroses listed above already. Thanks Doug and Merry Christmas! I can’t seem to stop laughing. You, too, Kathy. Merry Christmas to you and Dwight and the boys. Okay (wheeze, straighten, appear scholarly) I’m back. DG, How old were your sons in May 2001? Haha! Did Jonah and Jacob get merit increases? At least cost of living increases? In any case, you certainly can’t be blamed for not doing your best when it comes to child rearing. Merry Christmas! This brings back memories! My sister and I had something similar when we were about your boys’ ages but without the pay. Sheesh! Sounds a lot better to me than Susan Cheever’s practice of paying her children for allowing her to use them in her writing!